Use the full power of the TeeChart ActiveX Control on the server: Database enabled and with all export formats for use in your ASP, ISAPI, CGI or MTS application. Direct stream output as a browser independent format or the lightweight AX client control for AX aware Browsers, with a fully navigable, event driven Chart to work interactively with server sourced data. Now even stronger support for ASP and ASPX ! Export formats include: (JPEG, GIF, PNG, BMP, PCX, SVG, PDF, EPS, VML, WMF/EMF and Flex/Flash formats) and as data to HTML, XML, Text, CSV and Excel formats. Charts may be streamed directly to the browser to avoid maintenance of temporary files. It includes extensive code examples to guide the way. 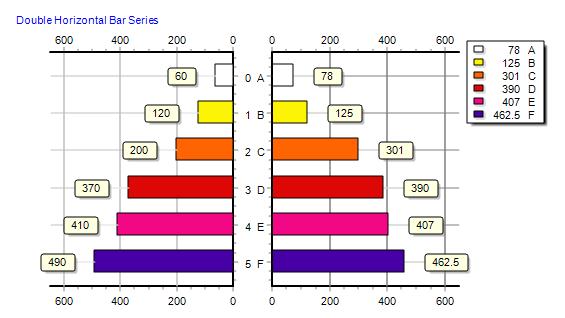 Chart Series internally use standard VCL Dynamic Arrays. This gives faster speed and less memory consumption. 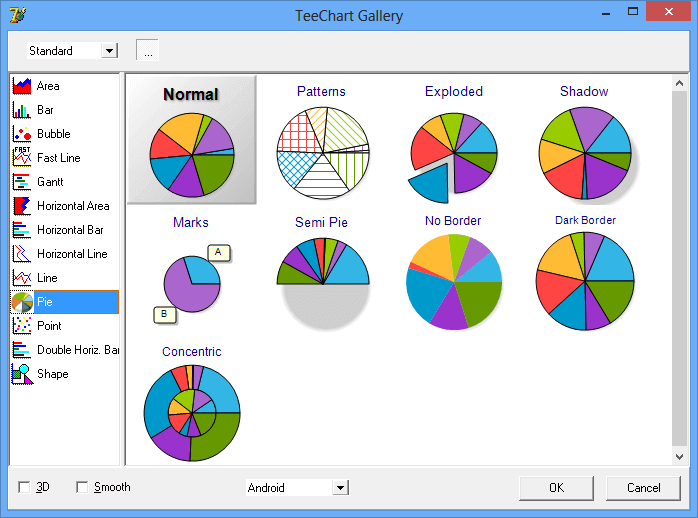 TeeChart graphical code speaks directly to Windows GDI API. Data is stored in dynamic arrays that are very closely mapped to memory which makes access and modifying the arrays almost as fast as the computer processor. The code is streamlined as much as possible to increase internal speed, especially when re-drawin. TeeChart includes powerful and complete editor dialogs, for almost every component and sub-component. These editors are available at design-time and also at run-time. The TeeCommander component (a toolbar with charting specific buttons) provides one-click access to TeeChart editors and common features. The help file and documentation include a reference guide, a user guide, tutorials with detailed "how to" explanations, end-user help and a comprehensive example project (with complete sources) that contains nearly 400 forms. Pressing F1 gives context help for almost all screens and source code elements. Any color (pen, font, gradient, brush, etc) is now treated as a proper 32bit color with RGB and Alpha components. The only limitation is pseudo-colors can't be used (vbButtonFace, vbWindowBackground, etc). Setting a color alpha transparency can be done at design-time using the chart editor dialogs, or by code with programming languages that support the rgba method. GDI+ has line antialias, which produces much better looking charts, without jagged diagonal and curved lines and polygon boundaries. There's a speed penalty when using antialias that is not a problem unless you're plotting many many points and/or performing animations. The base IPen interface has a new Fill property (of type IBrush) that is only functional when using the GDI+ canvas. Wide borders and lines (of width 2 or more) can now be filled with textures and gradients. Grid lines can easily be changed again to be non-solid, using the axis editor dialog. When False, series marks will be painted using their own transparency, without accumulating the marks series transparency, if any. 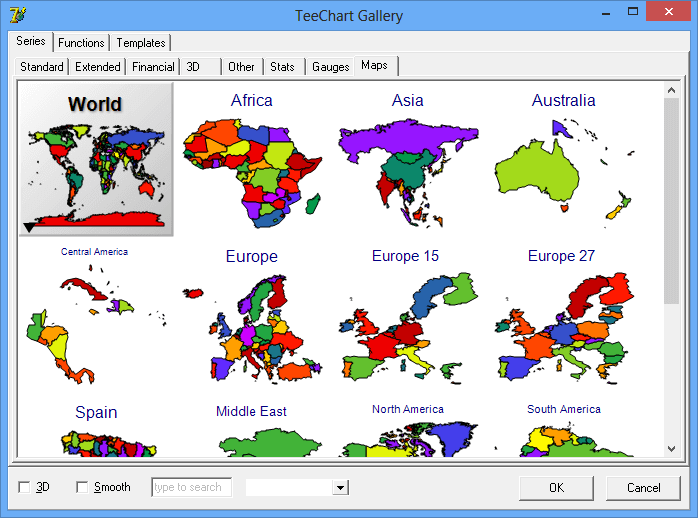 Changing the global visual aspect of charts has been improved extensively. New methods at IThemesList class to apply any existing chart formatting as a theme for any other chart. In other words, any chart can be used as a "theme" for any other chart. Only formatting is applied. That includes pens, brushes, gradients, fonts, etc. Also any chart saved as a native *.tee file can be later reused as a "theme", and it will appear at the Themes Gallery. Redesigned series gallery dialog, with a much better "sub" gallery to visualize different combinations for a single series style. New TeeFunction gallery, with example demos of each function type. When changing a series style using the gallery, styles that can't be applied appear disabled, now this is done internally using a gray-scale filter, which looks better and simplifies the code a good amount. New "Templates" tab at Gallery, with pre-defined Charts already using Series, Functions, Tools, etc. New option to export charts to OpenDocument (*.odt) spreadsheet format. XAML export format now includes the optional "Transform" elements. The Transparency property (from 0 to 100%) has been moved to the base Series class (ISeries) and implemented for all series styles. New Series.Marks AutoPosition boolean property (default True). New Series.Marks.SoftClip boolean property (default False). When True, marks aren't displayed if their associated point is not inside the chart axes space (ChartRect). This new property, when True, draws the same filled arrows in 2D than in 3D. Previously, in 2D mode arrows were always displayed with thin (no filled) lines. All Bar styles use now Brush Gradient or Picture properties to fill interiors. Implemented TickLines property for cylinder bar style in 2D and orthogonal 3D. Bubble series now resizes the horizontal axis minimum and maximum values to accomodate for the first (left) and last (right) bubble points sizes, according to their radius. This is controlled with the Pointer.InflateMargins property (default True). Note: This only applies when the Bubble horizontal axis scales are also automatic. The AutoSize boolean property (default True) calculates the appropiate (best fit) Candle width according to the available horizontal space and the number of candles to visualize. When adding Candle data passing the "X" horizontal value as DateTime, the axis will display gaps (holes) for periods where there is not data (for example weekends). The best solution to this problem, when possible, was to pass the "X" coordinate as a sequential integer number, thus making candles adjacent. HighLowColor property (default "cbUseColor"). When "cbSameAsCandle", the High-Low line is painted using the same color as the candle, and the properties of the HighLowPen property. BorderColor property (similar to the above) to paint the candle border using the Pen properties and the same color as the Candle. Fixed bug in Clicked method. New Hours, Minutes and Seconds property (IClockHand type) The IClockHand class defines how to draw the clock hands with several properties, including border and background attributes, visibility and the percentages of radius, width, height, ending arrow. New Center property (IPointer type), to display a shape at clock center (by default a circle). New CustomTime and Time properties. When CustomTime is True, the clock no longer refreshes every second and remains static using the Time property. This property draws the Darvas boxes with transparency, and its independent from the Candle Transparency property. New DrawStyle property (default flSegments) When setting it to "flAll", a single polyline call paints all series points instead of painting one by one. Note: Null values are not considered in "flAll" mode. FastPen with GDI+ disables antialias. When using GDI+ canvas, setting FastPen to True will disable antialias to paint just the FastLine series. This gives much more speed for large quantity of points, without sacrificing quality for all the other chart elements and series. New Callout property to draw arrows at gantt bar connection lines. Improved drawing calculations and new ShapeStyle property to optionally fill the gauge background. When showing individual bar values at Legend, the Legend is now inverted to show them in the same vertical order. New psDonut style for IPointer.Style property. New DrawStyle property (default dsSegments). Only for 2D and 3D orthogonal view modes. When DrawStyle is "dsAll", the line or area is displayed using a Canvas PolyLine / Polygon call instead of drawing each segment individually. When DrawStyle is "dsCurve", and only for GDI+ canvas, the line is displayed using a smoothing spline algorithm. When DrawStyle is not "dsSegments", this allows for example configuring the Pen.Gradient so the whole line uses the gradient colors, instead of using the gradient colors for each segment (segments between each line point), and also using the Pen.JoinStyle property to draw the connections between points. 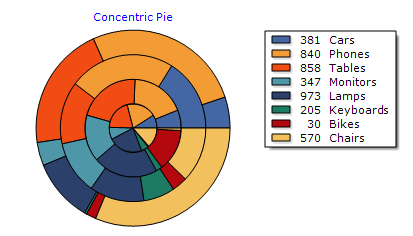 New value for MultiPie property (Series1.MultiPie = mpConcentric) to display multiple pie series as concentric donuts, in 2D and 3D. New PieMarks.EmptySlice boolean property (default False). When True, series marks for empty pie slices (of value 0) will be displayed. New AngleLabels property, merges and replaces all CircleLabelsXXX properties. New AntiOverlap property automatically calculates the best increment between circle labels. Horizontal Axis Ticks and MinorTicks are now displayed, when Visible. Values at Legend are inverted to vertically align with pyramids. Multiple Pyramid series display now at the same "Z" depth position. Improved calculation of left and right margins when the Volumen Pen is big (wide). Walls (specially the back wall) can now be displayed as rounded rectangles. Filters property. Image filters can be applied to a TChart itself (using the internal canvas buffer Bitmap). The Chart Editor dialog (General -> Mouse tab) has been enhanced with more options to control what happens when the mouse wheel is dragged. New ZoomWheel property (of type TMouseWheelStyle) to allow zooming the whole chart (in 3D / Orthogonal modes) by dragging the mouse wheel. New Zoom.MouseWheel property (of type TMouseWheelStyle) to allow zooming series data by dragging the mouse wheel. New IParetoTeeFunction This function calculates the cumulative percent (from 0 to 100%) of its source series values. A new Pareto template at "Chart Gallery -> Templates" dialog, uses this function. New TCentroidTeeFunction This function calculates the "center of gravity" XY point of its source series point XY positions. Centroid position is the average position of all points in the array. New tool TRepaintMonitor is an annotation that paints the current "Frames per second" speed when the chart is being animated or repainted lots of times. New AllowDrag new property, bands can be dragged using the mouse. New OnDragging event. Called while dragging the ColorBand using the mouse. New OnResizing event. Called while dragging the ColorBand Start or End edge lines using the mouse. 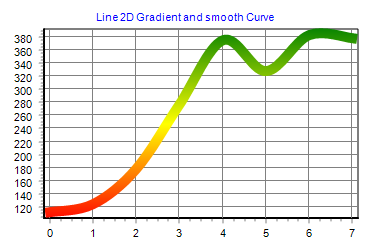 New NoLimitDrag boolean property (default True) to allow dragging the color band outside the axis min <--> max limits. IColorLineTool (and also Start and End lines of TColorBandTool) new property: Annotation. To display text located at line. New AnnotationValue boolean property, when True it displays the current line value using axis formatting, using the Annotation properties. New AxisAnnotation property, to display the current cursor position near the axis. New FullRepaint property (default False). When True, the whole chart is repainted while dragging the cursors. New RotateGradient property. When the arrow gradient is visible, gradient is rotated following the Arrow.Angle property. New Align property, to align the scroller to bottom/right ("saAfter"), or to top/left ("saBefore"), or "saCustom" for custom positioning of the scroll pager sub-chart. New NoLimitDrag boolean property (default False) to restrict scroll to main chart axis minimum and maximum. New automatic vertical alignment, when using it with "Horizxxx" series like HorizArea or HorizBar. New AddSeries and RemoveSeries methods, to customize which series should appear at the scroller chart, now allowing displaying multiple series (as you wish). Data changes in the main series are now reflected in the scrollpager chart series. When moving the mouse over the series, this event is triggered and the legend palette will paint the pointer indicator using the selected cell Value and Color. This property controls the total Legend transparency, including symbols and texts. The already existing Transparency property is only used when filling the legend background. New Zoom.FullRepaint boolean property (default False). When true, the zoom rectangle displayed while dragging the chart will repaint the whole chart at each mouse movement. This allows filling the zoom rectangle with brush color or gradients (for example semi-transparent gradients). Repainting the whole chart takes some cpu time, but for normal charts this is a very small cost. Many editor dialogs have been restructured and improved. There are many more "visual" galleries to customize properties. Many modal dialogs have been replaced with embedded versions (modal dialogs aren't suitable for touch devices). New EditTool method (at TeeEditTools unit) to show a modal dialog to edit a single tool component. TeePicture Filters editor dialog now includes a live color histogram chart updated when changing filter parameters. The ITeeAnimate and ITeeAnimation classes have been completely rewritten to provide smooth animations using a separate thread, and with more precision. Animations are now configured in milliseconds instead of number of frames, using the Duration property. The ITeeAnimate.Speed property defines the desired maximum number of frames per second (by default 60). Frames that can't be painted are skipped. New StartTime property, in milliseconds. DurationFrames function returns the expected number of frames, according to Animate.Speed property (the desired maximum number of frames per second). Inverted boolean property. The animation performs as opposite. Existing animations in previous versions (Expand and SeriesAnimation) no longer use Timer components, they internally use the same ITeeAnimate system instead. A generic "Animation" tool allows creating custom animations, composed of multiple items (individual animations with different properties) and a timeline. Multiple Animation tools can be added and played simultaneously, each one with specific duration and settings. Generic animations include NumberAnimation (to animate any integer, datetime or float property) and ColorsAnimation (to make color transitions, for any color property). New Animations gallery with demos, and editor dialogs for all animation classes. Animation classes include: Custom, Transform, Series, Expand and Random Points. New support to animate all visible Series on a chart, by setting the Series property to nil to indicate all series should be animated. New Series, similar to Horizontal Bar series to show double values for each bar (one at Left and one at Right). When a pointer item has been modified, changes to the global TChart1.Series(0).asLine.Pointer property will not be used. Palette colors (when UseColorRange is True), now support Alpha (transparency) which gets interpolated when calculating the color for each cell that corresponds to cell's value. The following new features apply to all elements derived from this class (Annotations, Chart Legend, Chart Titles, Series Marks, Organizational series items, Numeric Gauge Markers, TreeMap series items, and many other derived classes). Area series fix, transparency in 3D for the last Area segment. Bar, HorizBar series: Cylinder improvements (more smooth look) and better positioning of Marks inside Bars (MarksOnBar property). ITeeFont.SizeFloat property enables fine graining of font sizes. ITeeFont.Brush property, supersedes Gradient and Picture properties. New image filters: Sobel and Sepia. 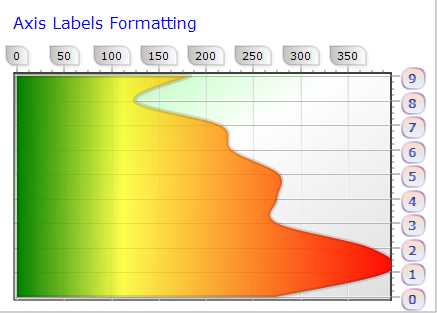 New IBackImage Bottom and Right properties, to draw Chart1.BackImage at a custom rectangle. New ICanvas StretchDrawQuality property (default sqHigh), to eliminate slow calls to SmoothStretch in GDI+. New TChart1.SetChartRect(int Left,int Top, int Right, int Bottom) method. 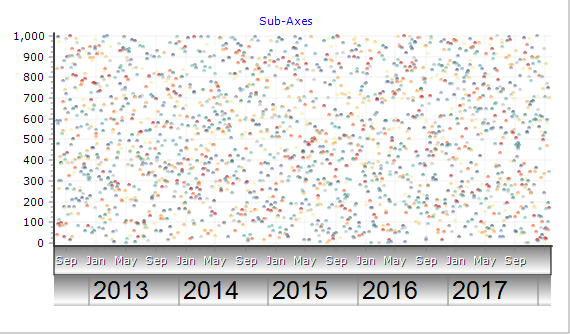 To customize the axes rectangle boundaries. 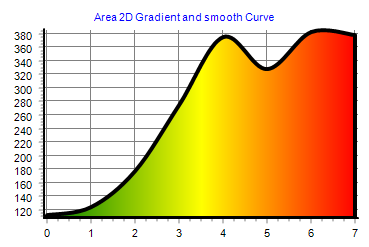 New AddArrayXYZColor method for 3D Series. IZoom.Pen.Width changed default to 3 pixels, for better visibility on big screens. Default Font Size for iOS applications, changed from 15 to 11. Croatia country added to "Europe 28" map. (Renamed from "Europe 27"). Improved display of rotated multi-line Text shapes (Marks, Annotation tools, etc). More improvements to TeeHTML methods (to display tagged html text inside shapes). ISurfaceSeries, HideCells property now defaults to True instead of False. ICustomBarSeries AutoMarkPosition, replaced with IMarks.AutoPosition property. IPieSeries AutoMarkPosition, replaced with IMarks.AutoPosition property. -Supports VBA and ASP (Active Server Pages) .